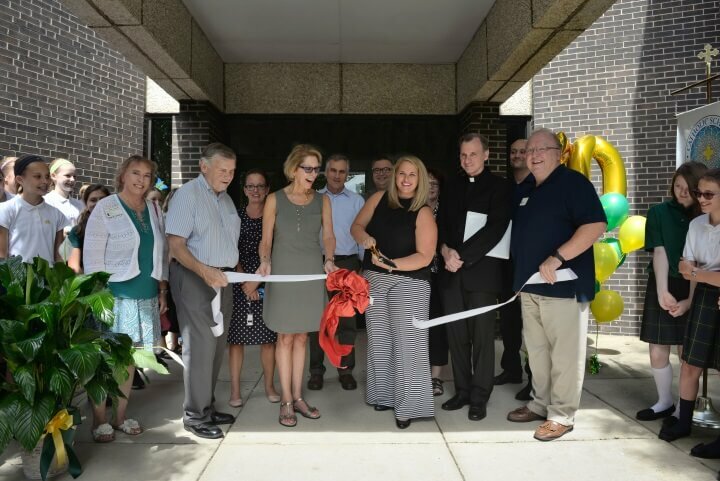 On Friday, August 26th, members of the Glen Ellyn Chamber of Commerce gathered with the staff and students of St. James School, as well as members of our parish community for an outdoor ribbon cutting ceremony in honor of 50 years in education. For five decades, our school has been blessed to receive support, encouragement and recognition from the fine people and businesses of the Glen Ellyn community. Our mission from the beginning has been to create an environment where our students may grow spiritually, intellectually, emotionally and physically as members of our school, parish and greater community. The success we celebrate today in fulfilling our mission could not be possible without all of those who have invested their time, talent and treasure to help us form young people of faith; lifelong learners who serve the broader community. As we move forward into the next 50 years, may we continue to mutually support one another in our endeavors to keep Glen Ellyn a healthy, safe and excellent community.